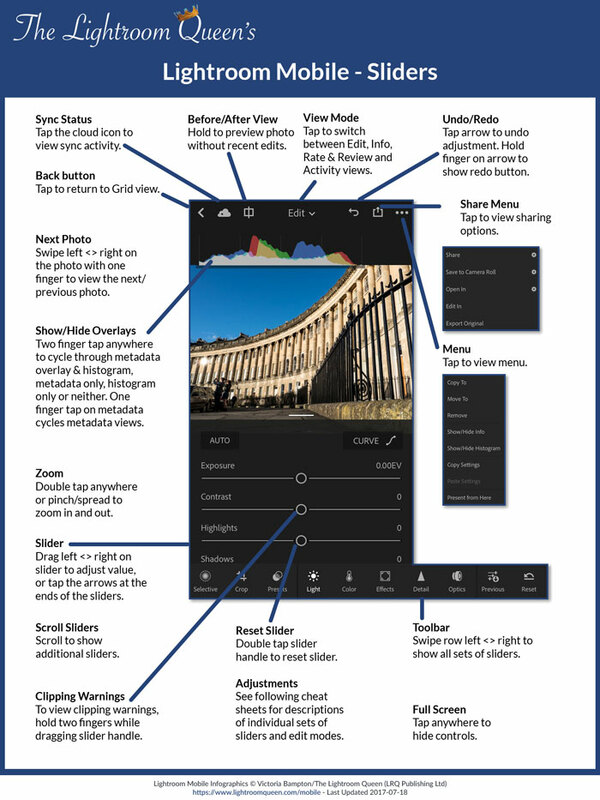 After discussing how to view, organize, rate and add metadata to photos, we finally get to the reason most people are using Lightroom mobile – editing! Some say that you shouldn’t edit photos on a mobile device because you can’t calibrate the screen, and that’s certainly true, but as long as you bear in mind the limitations of the device, the results are close enough to share online. 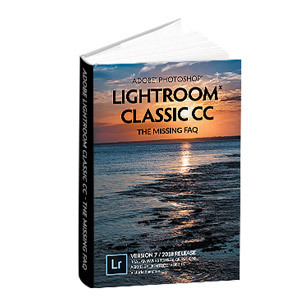 If the tones are critical, the photos can be checked and tweaked back on a calibrated monitor, as all of the edits are saved non-destructively and sync back to the desktop version of Lightroom. It is worth checking the brightness of the screen before you start editing, and some devices automatically adjust brightness. Selective allows you to make local adjustments using a linear or radial gradient or using a brush. Crop, of course, allows you to rotate and crop your photo. We’ll explore this mode next week. Presets allows you to apply the built-in presets, such as B&W conversion, color effects, vignettes, grain, and standard sharpening. The Light, Color, Effects, Detail and Optics panels are very similar to the sliders in the desktop Develop module, allowing you to make exposure and color adjustments, B&W conversion and other effects. If you’re working through a series of similar photos, they probably need very similar adjustments to maintain consistency. Previous copies settings from the previous photo to the current one. 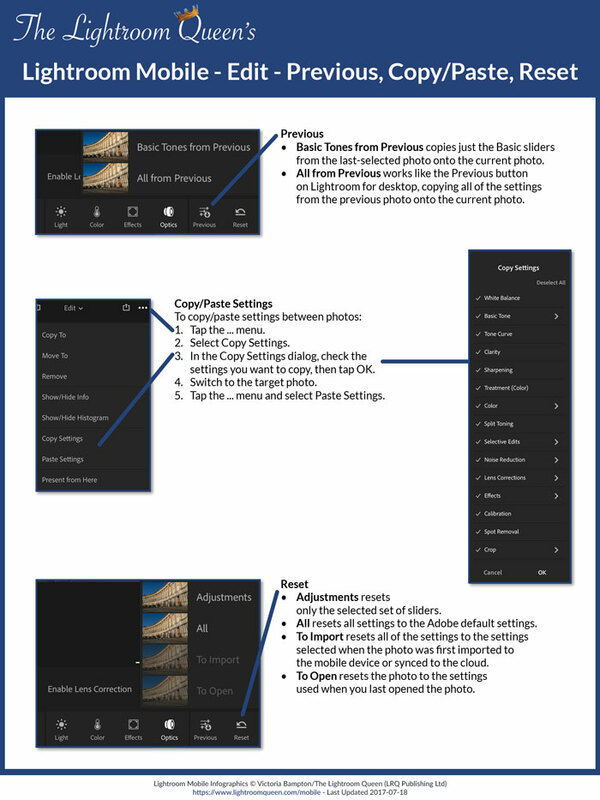 You can also copy and paste settings from one photo to another. Select Copy Settings from the … menu. In the Copy Settings menu, you can select which specific settings to copy to the clipboard. Scroll up and down the list and tap the arrow at the end of the lines for even more detailed options. Finally, select the target photo, show the … menu again and select Paste Settings. Reset resets the edits on the photo. To just reset a single slider, double-tap on the slider handle. Next week, we’ll learn how to use the Crop tool and apply presets to photos. We’ll be covering that in a later post, but in short, create a collection and check the arrow/checkmark to its left in the Collections panel. Or if you don’t want to put them in a collection, drag the photos to the All Synced Photos collection in the Catalog panel. 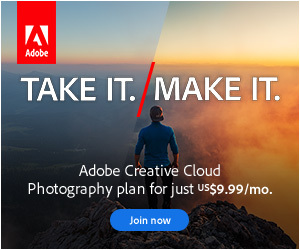 Just be aware that it’s not full resolution originals going to the cloud from Lightroom CC 2015, so it’s not a backup.